Make the whipped goat cheese ahead of time and reserve. 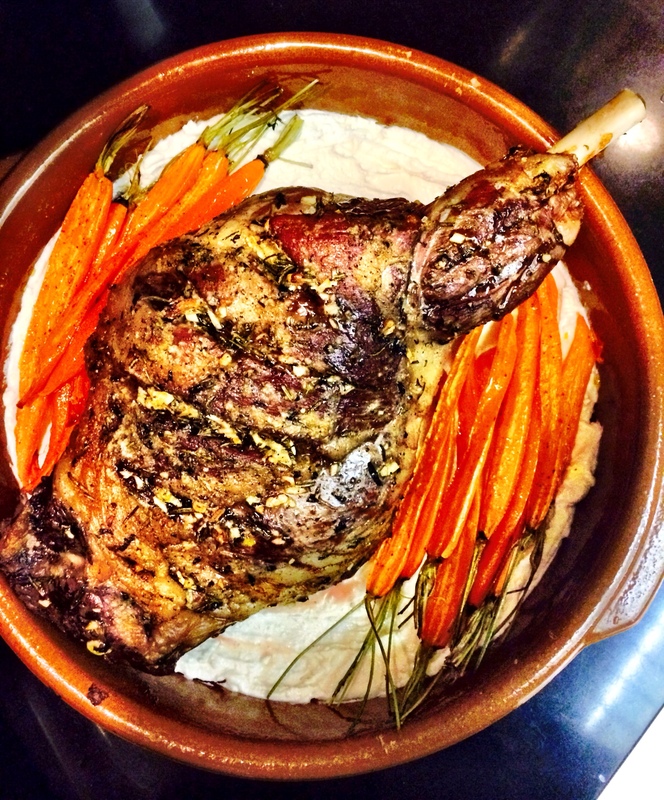 Up to 1 day ahead of time, season the lamb with the herbs, garlic, black pepper, and a few tablespoons of olive oil. Reserve in the fridge, and remove the lamb about 45 minutes before cooking. Preheat the oven to 375 F. Toss your carrots with a few tablespoons of olive oil, and season with salt and pepper. Roast in the oven for 35-40 minutes, until slightly softened and beginning to brown. Reserve. Reduce the oven temperature to 325 F. Place the lamb in a roasting pan, fat side up. Score 2-3 inch slits in the top of the lamb, and stuff the herbs and garlic into the slits to keep them from burning. Season the lamb generously with salt, and add more olive oil if needed. Roast in the oven until a thermometer reads 130 F, or about 1 hour and 20 minutes, for medium-rare. Let the lamb rest 15-30 minutes before carving. Serve the lamb on a platter on top of the whipped goat cheese, with the carrots on the side. Pour any juices from the roasting pan over the lamb. Drizzle with a little extra good-quality olive oil.